Every Saturday, I host a feature called Kid Konnection -- a regular weekend feature about anything related to children's books. This week, I'm going to share with you a two adorable picture books that celebrate the holiday season. HOW DO DINOSAURS SAY MERRY CHRISTMAS? 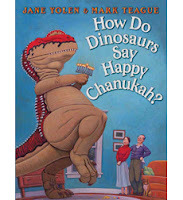 and HOW DO DINOSAURS SAY HAPPY CHANUKAH? are just plain adorable and a perfect way to introduce Chanukah and Christmas traditions to young readers. These picture books, by the successful writing duo Jane Yolen and Mark Teague, are funny and educational, and sure to be a hit with little ones and their parents. In HOW DO DINOSAURS SAY MERRY CHRISTMAS?, the story begins with the question, "On Christmas Eve, does a dinosaur sleep? Does he go up to bed without making a peep? ;" and it proceeds to pose many hilarious questions about all of the potential trouble a dinosaur could find. There are pages which show a dinosaur picking off ornaments, eating St. Nick's cookies, stealing ornaments and much more! Of course, the story ends by showing just how sweet and responsible a dinosaur can be! The story in HOW DO DINOSAURS SAY HAPPY CHANUKAH? is very similar to HOW DO DINOSAURS SAY MERRY CHRISTMAS?, except this time the book has a dinosaur wreaking havoc on a Chanukah celebration. Once again, the story demonstrates that a dinosaur would never, ever do those things. Rather, it shows all of the ways a young dinosaur can celebrate the eight days of Chanukah. 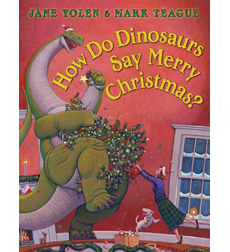 Over the past ten years, Ms. Yolen and Mr. Teague have sold over fourteen million books in the How Do Dinosaurs series; and I think their holidays stories might be their best yet. I have enjoyed this series with both of my children, and there's reason that it's been so popular with kids and parents for years. There is the right blend of humor and lessons; and as a mom, I love that the dinosaurs are so well behaved! Because these books do include some Christmas and Chanukah traditions, there are ideal for schools. I was extremely impressed that the publisher has some reproducibles to complement the classroom lesson. There are coloring pages, mazes, connect-the-dots (a personal favorite) and more! I think HOW DO DINOSAURS SAY MERRY CHRISTMAS? and HOW DO DINOSAURS SAY HAPPY CHANUKAH? are perfect to read this holiday season. Every house with young children should have copies, and I am certain that reading these books together will become yearly holiday traditions for many families! My Kid Konnection this week is about a girl with a hearing impairment. Dinosaurs and holidays sounds like a winning combination to me! I've been having such fun this year reading Christmas books to my little one. He loves dinosaurs and he's still little enough to enjoy picture books. Thanks for the review, I'll be looking into these soon. It seems that dinosaurs can tackle any topic. BTW, I don't see the link up box for this post. We love the dinosaur books and these sound adorable as well. I love the How Do Dinosaurs books! I may have to pick the Christmas one up for my niece. We love the How Do Dinosaur books at our house. I didn't know there were Christmas and Hanukkah editions - I'll definitely be adding those to our collection.